For my first review I decided to do a quick review of a book that I picked up because it has the same name as a famous song. 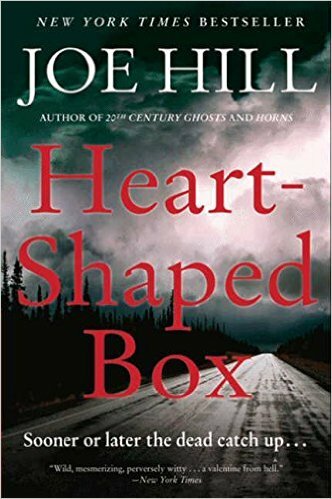 It’s the Heart-Shaped Box by Joe Hill. The book is rather good, even though it could be a bit better. I won’t go into plot details a lot, because I don’t want to spoil it for anyone that still hasn’t read it. What I think is that the plot twist might be a bit too obvious, or at least that’s how I felt. For example when I was reading the book I guessed it practically from the first time that the ghost appeared who he might be. Author should have tried to obscure that fact a bit more. Better yet use misdirection to throw us all on the wrong path when making guesses on who the ghost might be. 4/5 STARSThat’s it, let me know what you thought about Heart-Shaped Box, the book not the song. This entry was posted in Book Reviews and tagged book recommendations, book reviews by Annabel. Bookmark the permalink.